mosslandingoceanshores | Let the Adventure Begin! Vacation by the Beach in a Beautiful Log Cabin! Moss Landing Cabins guests, Trish and Tammy, took this amazing photograph on their beach walk out to Damon Point the first week in February. Everyone knows that Ocean Shores is known for its amazing wildlife, but this photo just took my breath away. 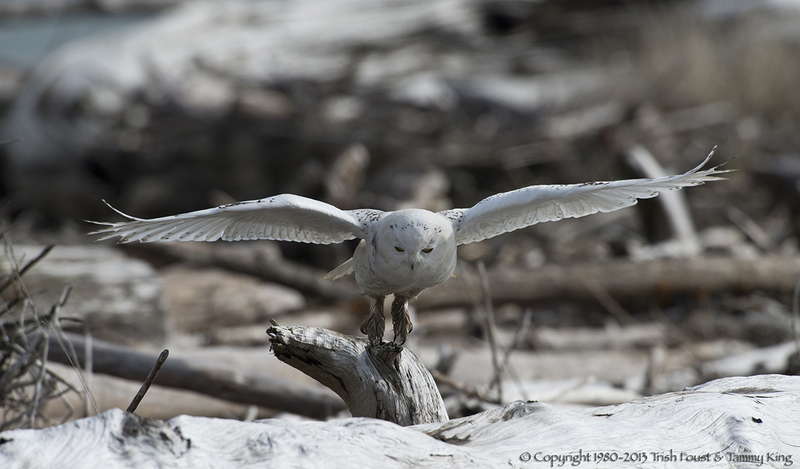 The Snowy Owls will probably be gone sometime in April, so if you want to try your luck at photographing these beautiful creatures, you should make your vacation plans sooner rather than later. Just be careful to show them the respect and consideration they deserve and don’t let your dogs or kids get close or scare them. They are nesting and their habitat is fragile. I’ve lived here full time for less than two years, and I’m constantly amazed at the different ways beauty shows its lovely face here. No, that’s not a misprint. 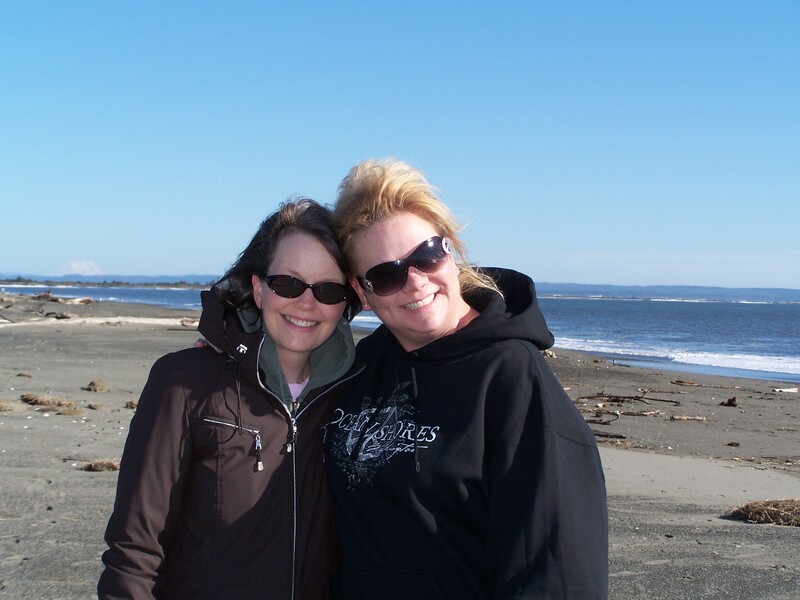 Sunshine…Ocean Shores…wintertime. Believe it or not, Ocean Shores has been enjoying a fabulously sunny winter. Last year, I was desperately seeking sunshine and even had my doubts about the decision Tom and I had made to move into one of our vacation cabins and manage the others. When I was trying to keep my cleaning supplies and sheets and towels dry while braving the rain and wind to get the cabins ready for guests, I wasn’t sure ANYONE would want to come to Ocean Shores in the winter. But come they did! I saw kids hunting Easter Eggs in a storm that I thought would have blown them right over. Our guests didn’t bat an eye when the storms came in. They just put on their rain gear and headed to the beach. Right now, we’re getting more sun and surf. If the fog and grayness are getting to you inland folks, check out the 10-day forecast, pack up the kids and the dog and head to the beach! Moss Landing is waiting for you! The secret is out! Moss Landing’s newest vacation cabin has quickly become very popular for couples who are celebrating birthdays, anniversaries, or just want to escape to the beach. At $100 to $125 per night, still the best deal in Ocean Shores. Ocean Shores is known as a wildlife preserve, but did you know they also do photo ops? Four buck, two spike and two with beautiful racks posed for a multitude of photos right in the back yard of Moss Landing Cabins. Now that I can catch my breath, I want to send out a resounding “THANK YOU!” to all of our guests that have made this such a wonderful summer. Tom and I (very nervously) took over the management of Moss Landing last winter. We moved into one of the cabins and made some decisions. Even though we had never done anything like this before, we figured we couldn’t go wrong if we followed the Golden Rule: Do Unto Others………… We thought about what we would want if we were in YOUR shoes. 1. It’s good to have (and be) a manager or owner on-site. We’ve been fortunate enough to get to know some of our guests, to share stories, campfires, and crab pots! We even had some guests flying remote control planes out in the street by the cabins. At night, the planes were lit up like Christmas trees. We had so much fun together that they came back and flew their planes here with us even though we didn’t have a cabin available that weekend. They stayed somewhere else and came to visit. 2. Most People are Good and Trustworthy. After reviewing all the fees being charged in addition to the rent and taxes, we decided our guests should get a fair shake. Most people don’t break things and not tell you. Most people take good care of their pets. Most people don’t leave the cabins overly dirty. So we did away with the cleaning fees, eliminated “pet rent,” and decided not to require a damage deposit or damage insurance. Just making those changes saves almost enough to pay for an extra night of vacation! 4. Cleanliness, Beauty, Comfort. No matter what your budget is, when you go on vacation, it should be a treat. And your vacation home should be CLEAN. You should never have to worry about smelly rooms, dirty bathrooms, or uncomfortable beds. 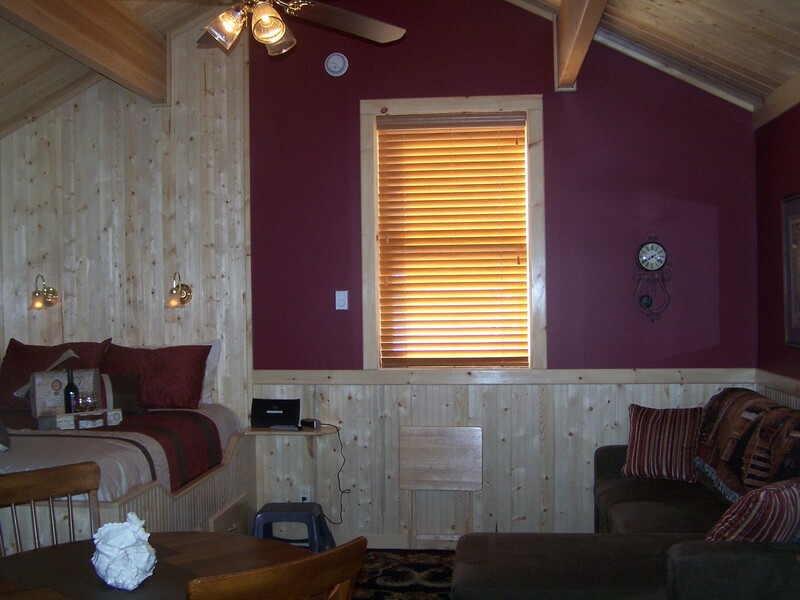 When we furnished our cabins, my number one priority was comfortable beds with lots of pillows. Much of the artwork and decor that we used in our cabins came from our own home. We never wanted our cabins to feel like motel rooms. And according to our reviews, they don’t! 5. Pets are Family Members. We don’t charge extra for kids, so why should we charge extra for pets? When I grew up, our pets were outside, usually sleeping in a box on the porch, or if it really got cold, we let them into the basement. Today, most people (us included) feel like our pets are members of the family. We wouldn’t dream of going on vacation without our 100-pound English Lab, Juneau. So we don’t expect our guests to leave their pets home unless they want to. So with those decisions made, we went to work to make Moss Landing Cabins even more beautiful and hospitable. And we have been busy. And our guests have been wonderful. Truly, we get the nicest people here at our cabins. All summer, our cabins have been full, and we’re hearing that many plan to come back in the winter time and enjoy the storms. Tom and I simply want to extend a heartfelt “THANK YOU” to all of our guests who have made this such a special and wonderful summer. This little gem was ready for vacationers on March 15th, and it’s been busy ever since! 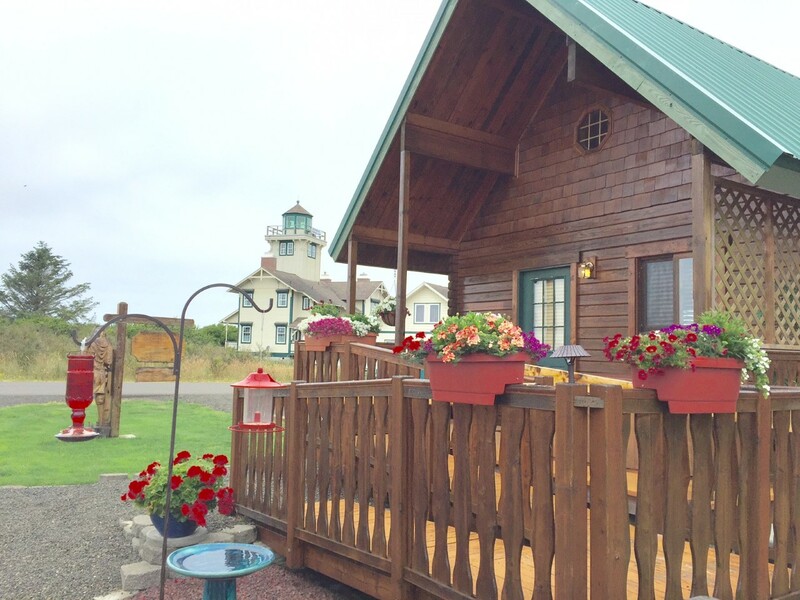 Captain’s Quarters is a smaller cabin, intended for a more “intimate” stay, but it still has everything you need for a fabulous few days in Ocean Shores. Probably the coolest feature is the built-in captain’s bed which fits into an alcove in the corner of the cabin. A mural of a tall-mast sailing ship under sail is set into the wall above the bed, making it look like you’re viewing the ocean from a window in the Captain’s Quarters. If you’re looking for a unique place to stay in Ocean Shores, this is it! Make your reservations to “set sail” and stay in Captain’s Quarters! Go to www.vrbo.com/464731 . If you prefer, you can email us at mosslandingoceanshores@hotmail.com or call us at 360-591-4049.